The MBB Bo.105 is a five-seat lightweight, general-purpose helicopter. Development of the Bo.105 started back in 1959 when Bölkow designed the Bo.103 helicopter. The Bo.103 single-seat flew first on 14 September 1961. The two-seat Bo.104 followed this study-project. Due to marketing reasons this project was stopped in favour of the five-seat Bo.105. Design work for the Bo.105 began in July 1962. Construction of the first of three prototypes began in 1964. The first Bo.105 prototype D-HAKO s/n V-1 was destroyed in ground tests and written off in October 1966. The second machine, D-HECA s/n V-2, was powered by two 317shp Allison 250C18 turboshafts and on 16 February 1967, the BO105 took off for its maiden flight in Ottobrunn (near Munich), Germany. On 14 May 1969, Messerschmitt-Bölkow-Blohm GmbH (MBB) was formed and development of the Bo.105 continued with the first production BO-105A, D-HABV s/n S-1, flying on 11 April 1970. The breakthrough came in 1974 when the German Army ordered the BO 105 as a connection and observation helicopter. In January 1992, the MBB Bo 105 became part of the large helicopters types row of Eurocopter when the helicopter divisions of MBB from Germany and Aerospatiale from France merged to form the Eurocopter Group. In 1993, the BO 105 CBS with a 25cm fuselage stretch and extra window was certificated. Over the years, license agreements for the BO105 CB/CBS versions with the Philippines, Indonesia and Spain were concluded, and for the BO105 LS, a cooperation agreement with Canada. Until production ended in 2001, as the BO105 was superseded by Eurocopter’s EC135, a total of 1,406 BO105s had been delivered to 55 customer nations. 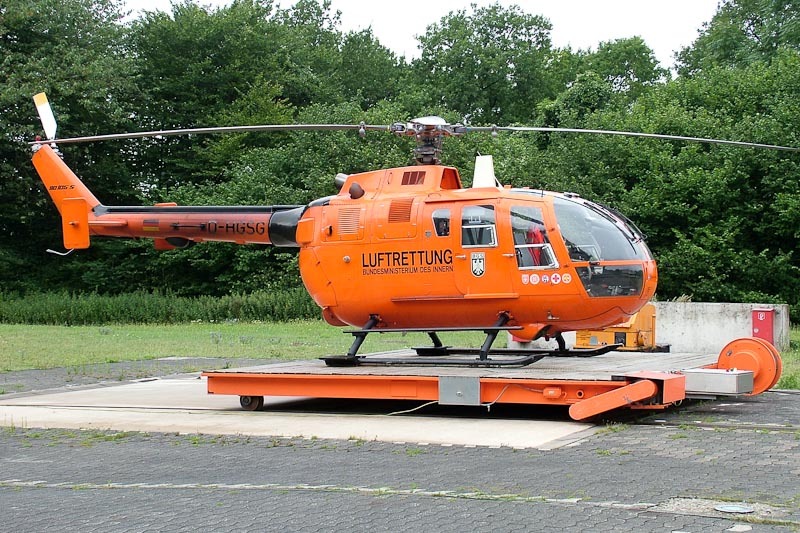 RTH (Rettungstransporthubschrauber) MBB BO.105CBS-5 D-HGSG of the Bundesminsterium des Innern/Katastrophenschutz was photographed at the helipad of the Luftrettungszentrum Bielefeld in Germany when in service as the "Christoph 13". The Air Rescue Station Bielefeld is situated close to the Bielefeld-Rosenhöhe hospital. The Bundesgrenzschutz Fliegerstaffel Nord flies the helicopters of “Christoph 13”. Operations of "Cristoph 13" in the Bielefeld area started on 3 July 1976. Call sign "Christoph" is used for the German lifeliner helicopters since 1970 and is derived of Saint Christophorus, the Patron Saint for all travellers. Eurocopter Germany leased the 1996-built MBB Bo.105CBS-5 s/n S-914 in 1996 for a ten-years period to the BMI - Bundesministerium des Inneren, o/b BGS - Bundesgrenzschutz, Hannover. The helicopters was registered D-HGSG in April 1996. On 1 July 2005, the Bundesgrenzschutz Fliegerstaffel Nord was renamed Bundespolizeifliegerstaffel Nord. On 18 April 2006, when the ten-years lese was ended, the D-HGSG was returned to Eurocopter Germany at Donauwörth. On 20 November 2006, after the helicopter was sold in Russia, the registration D-HGSG was cancelled. On 16 january 2007, the MBB BO.105CBS-5 was registered RA-02532 in Russia with Uralhelicom. The Eurocopter MBB BO.105CBS-5 in service as "Christoph 13" at Air Rescue Station Bielefeld was replaced by an Eurocopter EC135 T2+, on 20 August 2007.